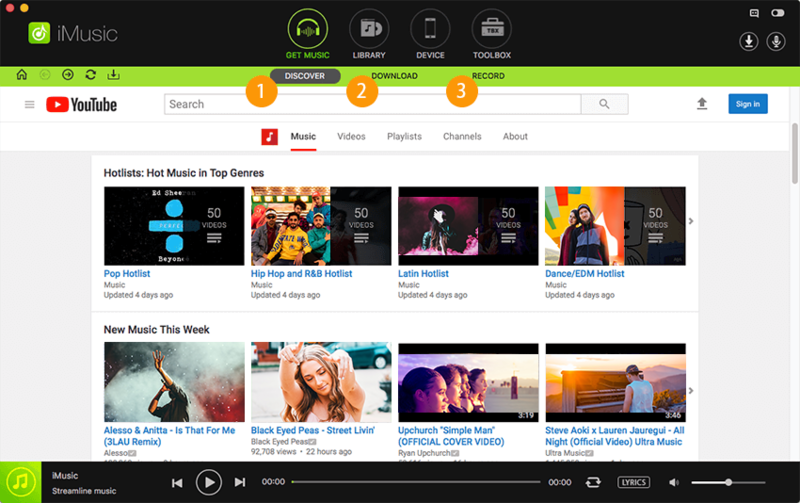 There are number of subscription packages that have been introduced by the company in relation to the Spotify services, but most of the users are unaware of the fact and the related terminology that works as a driving force. This article we writing to give proper knowledge of Spotify subscription. We are going to tell all the details about the Spotify subscription through such as types of subscription or renewing Spotify subscription and how you can cancel your Spotify subscription. 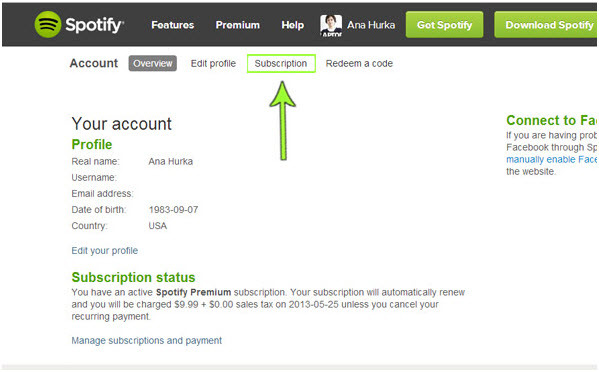 Part 2: How to Renew Spotify Subscription? 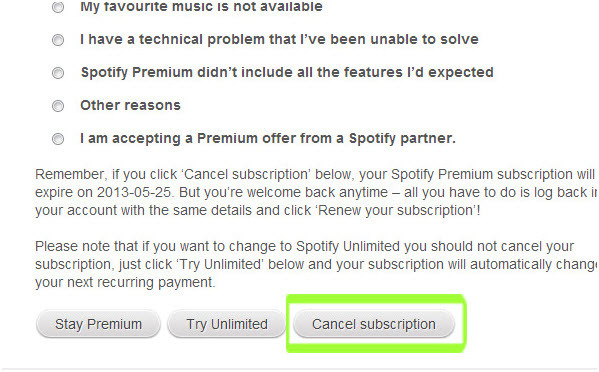 Part 3: How to Cancel Spotify Subscription? As it has been mentioned before as well that there are number of subscriptions are provided by the company to give best services to the users by taking care about all age groups. 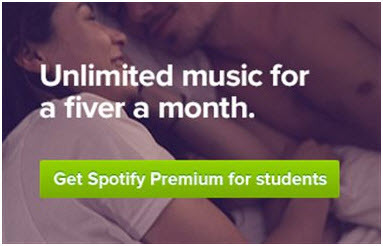 Because Spotify take care about all age group people such as family, student and individuals as well. In this section of the tutorial, we will tell you about different plans available from the Spotify company for all types of user. So you will get best subscriptions according to your requirement and choice. We will tell about the difference between each and every plan available from the company. If you want to change that plan for next month, you need to take care about it because Spotify will automatically deduct for the current plan in the end of the current month. The difference has been explained below in full detail to ensure that the user enjoy all the services at almost no cost at all. And the budget to this service also remains according to their pocket and with the requirements of the users. When a user signs up for the Spotify account, then the Spotify free is the plan that is given by default to all user who sign up first time. It is the first plan of the Spotify which help user to get the free membership for the first 7 days to test the services of Spotify and to make final decision whether to buy paid premium plan or not. This strategy of the company is very good and give the user a time of 7 days to enjoy their services for free to know about the proper services of the company. By using this offer free from the company, user can go for premium plan easily after using their services and testing sound quality and availability of songs. 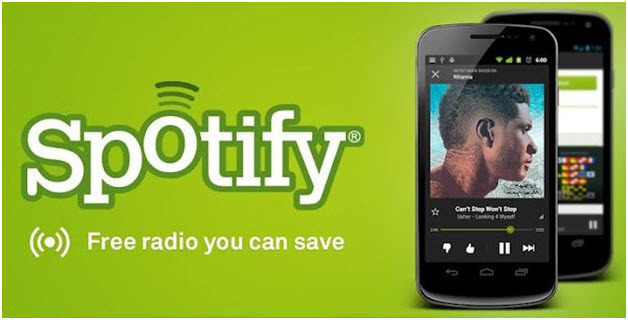 This plan is paid subscription of Spotify to enjoy unlimited music. The difference in the free plan and this plan is that user can enjoy unlimited music by paying some amount offline and online in this plan. 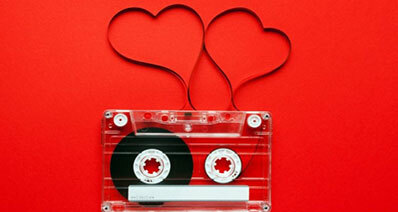 Free plan allows user to listen songs only they cannot download their favorite tracks on their system to listen later. It means in this plan you can download or sync songs on your devices for offline listening. In this plan, user will get a great quality sound with high quality 320 kbps. 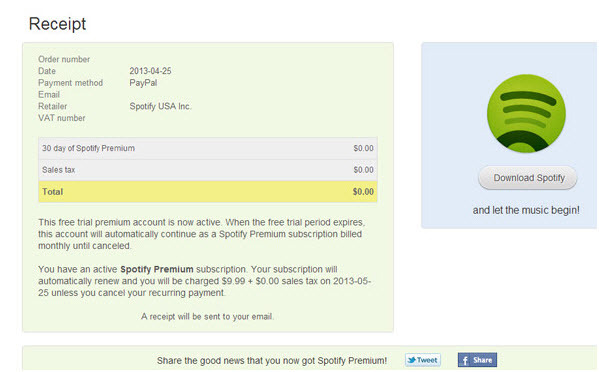 You can buy this plan after complete satisfaction in the free plan about the services of Spotify. The cost of upgrade is $0.99 and the full subscription is charged at the rate of $10 per month. It is a free subscription that has been launched by the company to provide premium service to the users free of charge for a time period of 30 days. The only difference between the free and the trial subscription is that the user in order to avail the trail version, you need add the credit card information and the details are provided to the company so that the subscription is renewed without any issue after the trial period ends. 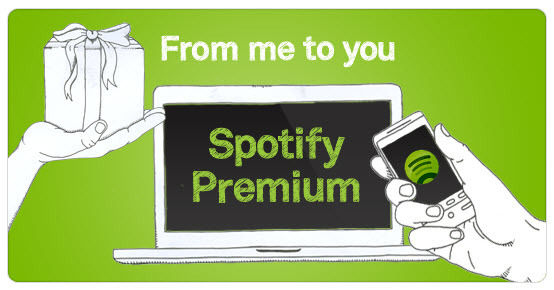 Before adding your credit card details in the Spotify website, keep in mind to cancel your subscription before 30 days if you don’t want to enjoy premium services. 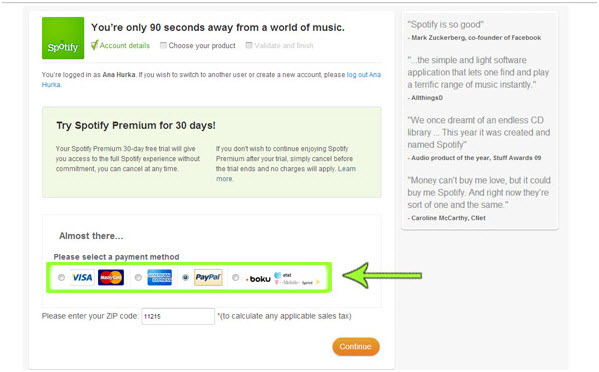 If you will not cancel your subscription before the last day of trail, then you automatically converted to the premium and Spotify will deduct fee for the next month. 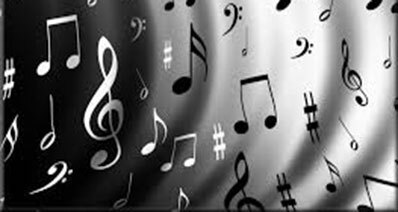 It is one of the best packages that were introduced in the past and all the users who have a real thirst of music were able to subscribe this plan. This plan was available for 4.99$ per month fess. But now this plan is closed by the company and the users cannot renew this plan now. User who were using this plan they will be automatically converted to the premium plan of Spotify which costs 9.99$ per month. To capture a very large student market, this package was introduced and the students get a discount of 50% for the total premium package cost if they have been verified successfully. This is the best package and the students are using is continuously. It is not only continued but the users and company also getting best results with this plan. Students are able to listen music in half price and revenue of company is regularly increasing by presenting this plan. But to listen the music by using this plan student need to upload their college document to the below url to get verified. 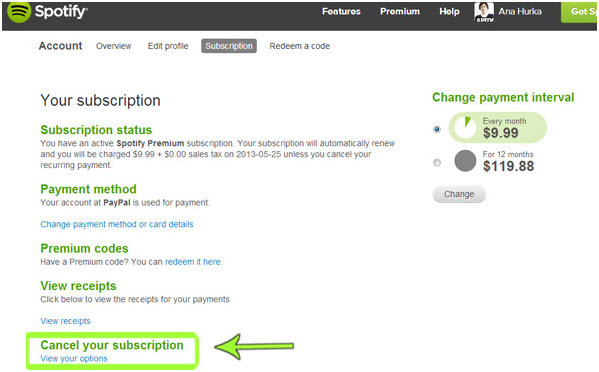 Renewing a subscription plan of Spotify is really very simple and easy to do. You can follow the following steps to renew you plan and regularly enjoy your music without any interruptions. 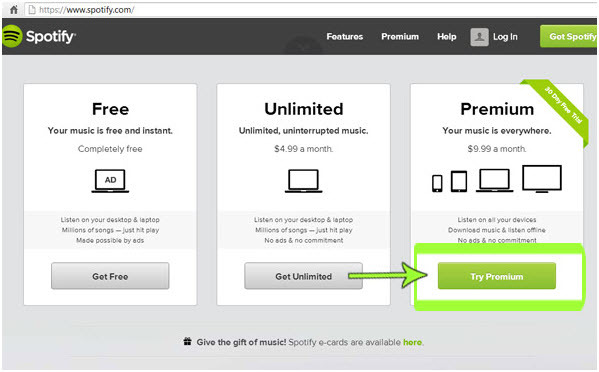 Step 1 The user should visit the official website of the Spotify which is available below and select your plan which you are using. In these steps we will tell you about renewing premium plan. After visiting Spotify click on the premium plan. Step 2 After clicking on the premium plan, you will be redirected to the payment page to select your payment method from here. Step 3 After you have selected your payment method and paid from your credit or debit card, you will get a receipt of the payment you paid. Step 4 Now login to your account and go on your profile page. Click on the Subscription tab on your profile page. Step 5 Here you can see that your subscription is renewed. On this page you can change setting that you plan can automatically renewed monthly. You can add your card and continuously it will deduct payment for every month from your card automatically. 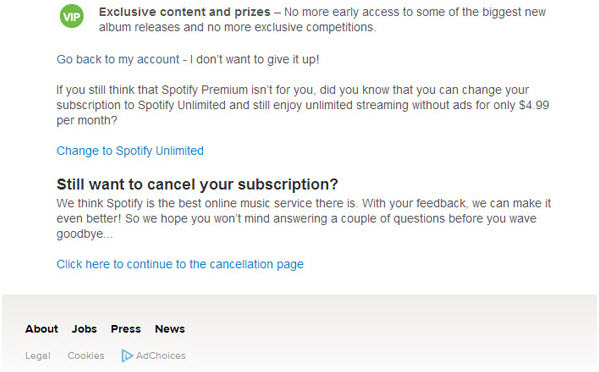 If you are looking to cancel your Spotify subscription, we are going to tell you each and every step with screenshots. Step 1 First of all visit Spotify.com and login to your account. Once you have logged in move cursor on your profile page and click on the Account tab. Step 2 After coming on your account page, click on the subscription tab to go on your subscription page. 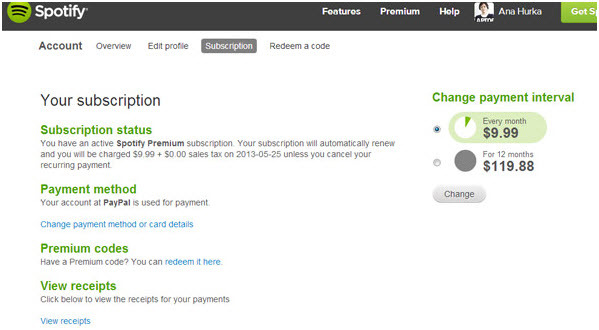 Step 3 On this page you will see option of Cancel your subscription. Just click on this button just like as shown below in the screenshot. Step 4 You will be redirected to the next page, now and it will ask your confirmation to cancel your subscription. Then click on the option "Click here to continue to the cancellation page"
Step 6 Now you need to reenter you Spotify account password to confirm that you are going to cancel your subscription. 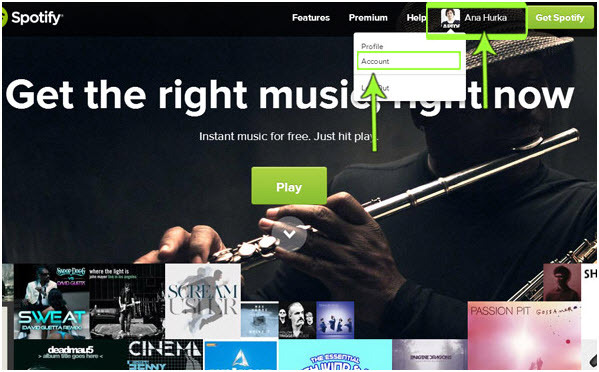 Once you have entered your password, click on "cancel Spotify premium subscription". Now your subscription is successfully cancelled you don’t need to pay more.